The Bishop Carroll Eagles will try to avenge last year’s 49-13 loss when they travel to face the Derby Panthers on Friday. Bishop Carroll, undefeated thus far, have boasted an explosive offense as it averages 40.75 points per game. Last week, the Eagles showcased the defense as well during a 30-0 win over Wichita East. Senior quarterback Braden Howell leads the Eagles offense, passing for 244 yards and two touchdowns during the win over East. He’s passed for more than 1,000 yards and 11 touchdowns on the season. Bishop Carroll entered the season with high expectations as it returned seven starters on each side of the ball from last year’s team that finished 7-3. So far, the Eagles haven’t disappointed in wins over Wichita Northwest, Salina South, Wichita West, and Wichita East. Derby entered the season as the top-ranked team in 6A but dropped in the rankings after a 50-20 loss to Goddard in Week 2. The loss to Goddard snapped a 24-game winning streak for the Panthers. However, Derby made a statement with last week’s 61-18 win over previously unbeaten Hutchinson. The Panthers trailed Hutchinson 18-15 late in the second quarter, but then exploded for the game’s next 46 points. Running back Brody Kooser rushed for 181 yards and three touchdowns. Derby’s defense held Hutchinson’s offense to 3.9 yards per carry. A pair of Central Kansas League teams match up with long streaks. Pratt, the defending Class 4A, Division II champion, has won 12 consecutive contests. Hoisington, according to Cardinal play-by-play broadcaster Cole Reif, has captured 21 straight home wins. Last year, Pratt fell to Hoisington, 32-14, before its surprising run as eventual state champion. Hoisington was ranked No. 1 in Class 3A most of the year before losing in the sub-state title game to Hesston. This season, Pratt has quality home wins versus Larned (56-46) and Nickerson (28-14) behind standout junior running back Travis Theis. The Greenbacks are one of five unbeatens left in 4A-II with Scott City, Santa Fe Trail, Colby and Columbus. Pratt leads the classification in scoring offense with 182 points. Pratt has averaged 390 rushing yards a contest behind Theis, who has 87 carries for 882 yards and 15 scores. Senior Landen Studer is his usual steadiness with 8 of 10 passing for 160 yards with a 2/0 TD/INT ratio. He has rushed 25 times for 241 yards and three scores. His career, Studer has completed 59 percent of his passes with a 15/5 TD/INT ratio. Pratt, unranked to start the season, has risen to third in the poll. Hoisington had major graduation losses and has opened 3-1 with a 7-3 win against Kingman, a 35-20 road loss versus Wichita Collegiate, a 53-28 win against Hillsboro and a forfeit victory against Washington County last week. The loss to Collegiate ended the Cardinals’ 27-game regular season winning streak. The Cardinals have still averaged 226 rushing yards a contest and have thrown just three passes on 98 total snaps. Senior Sean Urban and sophomore Wyatt Pedigo have combined for 58 carries for 454 yards and six rushing scores. They rank 1-2 in tackles; Pedigo with 14 and Urban at 13. Since ’04, these teams have met just three times with all the meetings coming in the last three years. Hoisington won 21-7 in ’14, 34-14 in ’15 and 32-14 last season. This time, Theis continues to post big numbers, and Pratt has too much offense. There will be one fewer undefeated team in Class 3A after the Perry-Lecompton Kaws travel to face the Sabetha BlueJays on Friday. Perry-Lecompton is averaging 63 points and has scored no fewer than 56 points in a game. The Kaws are effective on the ground, rushing for 345.3 points per game. Junior quarterback Dalton Kellum has rushed for 507 yards and 14 touchdowns on only 43 carries. He’s also passed for 308 yards and four touchdowns. Senior Tyler Erickson and junior Shane Quinlan have rushed for 385 yards and 212 yards, respectively. Sophomore Grant Roush leads the Kaws defense with 41 tackles. And while Perry-Lecompton is led by its offense, Sabetha boasts a top defense. The BlueJays earned a shutout over Holton in Week 2 and have allowed only 19 total points. Sabetha’s offense is led by Mason Engelken with 337 yards and three touchdowns on 38 carries. Junior Joe Gruber has added 243 yards and four touchdowns on 42 carries. Cauy Rokey leads the Sabetha defense with 43 tackles. The Kaws’ four wins have come against teams with a combined 2-14 record, while the BlueJays’ wins were against teams with a 9-7 record. Sabetha won last year’s meeting 28-7. The Centralia Panthers are looking to rejoin the elite ranks of Class 2-1A after suffering through an injury-riddled 2016 season. The Panthers finished just 1-8 last year, including a 53-19 home loss to Nemaha Central. On Friday, the Panthers will travel to Seneca to take on Class 3A’s top-ranked Thunder. Centralia has won three straight games after a 28-6 loss to Sabetha to open the season. The Panthers turned the ball over three times in the loss to the still unbeaten Blue Jays. The Panther offense is averaging 35 points per game under the direction of quarterback Trenton Flentie. Flentie missed most of his junior season with an injury, but is off to a great start during his senior campaign. Flentie has rushed for 521 yards and seven touchdowns this season. Nathan Rempe has added three touchdowns, and sophomore Kamble Haverkamp is a threat as a back or receiver. In the past two weeks, Centralia has rushed for 517 yards against Troy and 380 yards in last week’s win over Doniphan West. Duplicating that type of success this week will be a challenge against a Thunder team that is allowing 13 points per game. Meanwhile, Nemaha Central is averaging nearly 50 points per game. The Thunder have posted quality wins over Holton (30-18) and Jefferson West (35-14) in consecutive weeks. Mitchel Henry leads the Thunder with 441 yards rushing and six touchdowns. Henry has also completed 29 of 39 passes for 497 yards and six touchdowns. Henry also returned an interception for a touchdown in the win over Holton, while Noe Gauna blocked a punt for a score. Nemaha Central has won 19 consecutive Big Seven Conference games, but this is a showdown with one of the best from the Twin Valley League. The Thunder still is the favorite to win a third straight against Centralia. A Northwest Kansas League matchup that has significant District 8 ramifications and an effect on the top-5 rankings in Division I.
Hoxie has outscored opponents 174-6, while St. Francis has a total margin of 208-12. The Hoxie Indians rank first in all of eight-man football in scoring defense, while Sainty is tied with Division I’s Clifton-Clyde and Division II’s Hanover for second. Hoxie defeated Atwood-Rawlins County, 22-6, in a key District 8 matchup last week. The Indians, 6-3 last season, lost to Wallace County, Atwood and St. Francis in Weeks 3-5 last year, though has defeated the first two teams already this year. Hoxie has one of eight-man’s largest, most experienced lines with Oakley senior transfer Chris Cox and juniors Colton Heskett, Taye Washington and Jarrod Dible. Cox has eight TFLs, while Heskett has six and Dible with three. Senior Troyal Burris has punted exceptionally with eight punts for 44.8 yards a punt and six inside the 20-yard line, including a key punt against Atwood that was downed at the 1-yard line and eventually helped lead to a safety. Senior Latham Schwarz has 65 rushes for 457 yards and 11 scores. Junior Jared Kennedy is 12 of 25 passing for 161 yards with a 3/3 TD/INT ratio. St. Francis, the defending state runner-up, has not lost in the regular season under third-year coach Rodney Yates. Since Yates took over, St. Francis stands first in all of eight-man football in scoring defense. Sainty is one of the few teams that can come close to Hoxie’s size with senior lineman Trayton Doyle and senior end/linebacker Dalton Straub. The Indians have been very explosive. Sophomore quarterback Brady Dinkel has a 12/2 TD/INT ratio in his first season as a starter after taking over for Quinton Cravens. Junior Jordan Raby, who replaced all-state running back Taylor Rogers, has 12 rushing scores. Coach Rodney Yates said senior Tate Busse has scored in every possible way, except a punt return and throwing a touchdown. The line has played well with Doyle, a returning all-state selection, along with seniors Luke Lampe and Luin Norris. Including the 11-man ranks, St. Francis has won seven straight in this series, dating back to a Hoxie victory in ’04. None of the last four games are closer than 36 points, including 50-0 last season. Thus far, St. Francis, Hoxie and Spearville have separated themselves on the west side in Division I. The key matchup will be Hoxie’s defensive backs that have intercepted nine passes and helped force 15 turnovers en route to a plus-nine margin against Sainty’s speed, specifically Busse on the edge. St. Francis gets a slight edge in the passing game and big-play ability. This week is one of many huge matchups in the next five weeks in Eight-Man, Division I, District 4. Logan-Palco is undefeated, while Victoria stands at 3-1. Bennington is 4-0, while Solomon and Osborne – both 3-1 – play Friday in Osborne. Logan-Palco has outscored teams, 226-22, against the second-weakest strength of schedule in Division I, according to Prep Power Index. The Trojans have a collective 138-0 margin in the first quarter. The Trojan defense has limited three of four teams under 80 yards in total offense. Each game has been over at halftime. Victoria has played the No. 9 SOS with a margin of 164-42. Last season, Logan-Palco delivered a signature win with a 50-28 victory versus the Knights. The game was closer in total yards as the Trojans outgained Victoria, 338-318. The key difference came on third/fourth down. Logan was 7 of 11 in those critical situations, while the Knights were 6 of 7. 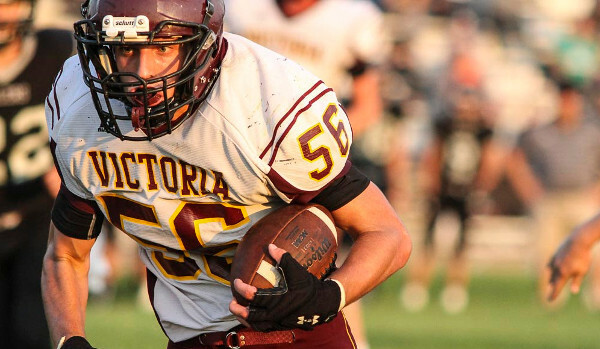 Victoria finished 5-4 and ended its streak of 14 straight playoff berths. This fall, the Knights vaulted into the rankings with a season-opening road win, 34-8, at Central Plains, then ranked No. 1. Victoria lost to Otis-Bison, 22-20, last week on the road. The Knights scored in the fourth quarter but didn’t convert the game-tying two-point play. Victoria held a 290-250 yardage edge. The Knights won 21 straight home games from Week 2 of 2012 to the start of 2016. Victoria lost three straight at home to open ’16, then captured its season finale, 54-6, against Solomon. The Gorillas had defeated Logan-Palco last year to earn the district runner-up behind state titlist Osborne. The Knights have plenty of experience in the backfield with senior backs Collin Kisner and Cooper Pfanenstiel. Kisner, who started the season at quarterback, has turned over the passing duties to Cooper Windholz. He has rushed 50 times for 548 yards and nine rushing scores, including 201 yards versus Otis-Bison. Victoria finished 0 of 5 with an interception in the passing game last week. Kisner is arguably the fastest player in Doug Oberle’s 12 years as head coach. He rushed for 1,210 yards as a junior. This year, Victoria is 2-0 at home, including a win against 3-1 Macksville. Since the start of ’15, Logan-Palco is 18-4 with all four losses coming on the road. Senior David Thompson, one of the state’s top players, has 45 carries for 579 yards and 10 rushing scores. The Trojans have averaged 260 rushing yards and 12.1 yards a carry in a dominant first month. Senior Riley Allen has stepped in well for veteran Josh Van Laeys and completed 3 of 4 passes for 89 yards with two touchdowns against no interceptions. Seniors Blake Bouchey and Thompson lead the team with 36 and 35 tackles. A key area to watch is special teams. Oberle has generally strong special teams and has turned several games in the Knights’ favor in the last several years when key special teams plays, including successful fake punts, blocked punts and scores off returns. Thompson has a big game, but the Knights, at home and with Kisner’s speed, give Victoria a slight edge.